In 2001 the online community of Italian steel was born, representing today the reference point for the steel industry. Siderweb.com is not just an information service that provides daily news, interviews and insights on the steel sector. The organization of events such as Made In Steel, Focus and Siderweb Outlook have made it possible to bring together the major players in the steel industry in a single community. Real, but also digital at www.siderweb.com. From over 12 years Siderweb offers daily information on steel industry, with news, exclusive interviews, daily press review and steel columns. The Study Centre, analytical heart of Siderweb, offers insights, data and analysis. 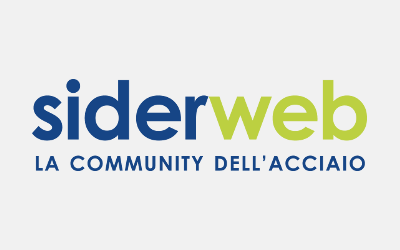 Siderweb also provides certified quotations of steel products on the Italian and international market. Customized courses to study and acquire knowledge. This is the training area of Siderweb, which can also count on a network of consultants and industry experts. Study of the annual financial performance. In 2014, we analyzed the 2013 financial statements of 2,500 companies in the Italian steel supply chain. Meetings and discussions moments, vertical in-depth dedicated to one or more product performance on the Italian and international market. Current and future prospects of the steel market and steel industry nationwide. Analysis, testimonials of entrepreneurs and customer demands comparison for a 360 ° panoramic view on the sector. Made in Steel, “Bilanci d’Acciaio”, Siderweb Outlook and company anniversaries, these are the main events organized by the community of Italian steel.